This post, by Carlos Carrazana of Save the Children, is cross-posted from the Global Food for Thought blog, a product of the Global Agricultural Development Initiative at the Chicago Council on Global Affairs. To the unassuming observer, the Guatemalan Quiché highlands are a breathtaking sight of lush, rolling hills and quaint mountaintop villages. I visited one such village, called Media Luna, about 100 miles outside of Guatemala City, during a trip to the region this summer on behalf of Save the Children. To get to it, you have to drive along a steep mountainside road until you’re up above the clouds. Be prepared to be mesmerized by panoramic vistas unfolding before you—even as your stomach drops at every hairpin turn. Getting out of the car, all dizzy from the drive and the high altitude, our group of Save the Children and USAID representatives was greeted by smiling villagers in colorful dress who welcomed us into their homes. It wasn’t until we started speaking with the local families, seeing first-hand how and where they lived, that we were faced with the reality of what it means to call such an isolated, albeit beautiful, place home. Media Luna, much like most villages in the area, is simply a collection of tin-roofed wooden huts scattered among the grassy hills and steep cliffs, with not much else beyond the beautiful natural landscape for as far as the eye can see. The nearest market is miles away. But without public transportation, the only way for most of the villagers to get anywhere is on foot. Though the hills are lush, farming on steep slopes that are prone to erosion, landslides, drought and flooding is challenging, to put it lightly. Only 1 percent of farmers here have regular access to a water supply for their land and dry soil yields smaller crops. And so the vicious cycle continues. It quickly became clear how a place so green can have a child malnutrition rate that’s higher than in the brown deserts of Africa. Among indigenous populations in rural parts of Quiché, 72 percent of children under the age of 5 are chronically malnourished. This means they don't get enough of the right kinds of food each day to fuel their growing brains and bodies, which results in stunted growth and development. A year ago, Isabella, 5, was one of these children. She was chronically ill. She had headaches, fever, no appetite and wasn’t growing. Concerned for her daughter’s health, her mother, Theresa, 24, took Isabella to the local health clinic. A community health worker recommended that she enroll in Save the Children’s goat milk program, designed to help chronically malnourished children get the key nutrients they need. In just six weeks of receiving a glass of milk a day, Isabella had gained two pounds and stopped getting sick. While in Quiché, I met another proud parent, Diego. A father of seven, Diego, 42, lives with his wife and children in Media Luna. When Diego first enrolled in the goat program in 2008, he only had one goat, whose milk he relied on to feed his lively brood of six boys and one girl. Five years later, Diego’s children are thriving and he has transformed his single-goat pen into a six-goat budding business, selling milk, goat cheese, as well as natural fertilizer and pesticide from the animal’s droppings and urine. 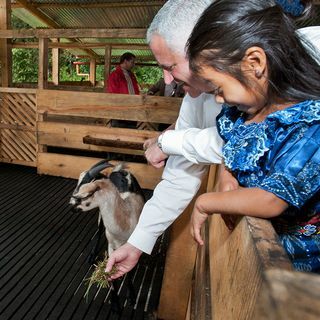 Building on the success of our family goat model, Save the Children—with support from Green Mountain Coffee Roasters, Inc. (GMCR) and the U.S. Agency for International Development (USAID)—opened the Highland Goat Production Center in Quiché. I attended the opening ceremony in July, along with some of our program funders and local officials. Currently housing 85 goats, the center has capacity for 320 and will serve 92 surrounding communities. Over the next three to four years, 1,600 families and more than 2,500 children will benefit from the goat center. In addition to receiving milk for their children, the families participating in the program are learning how to generate income year-round by raising goats and other farm animals, selling surplus milk, and making cheese and yogurt. It’s important to note that this project would not have been possible had it not been for the early food aid investments by USAID, which helped strengthen the agricultural production of small-holder farmers in the area. The goat program and the new center demonstrate how low-cost, effectively used public and private investments can make a real difference towards ending child hunger by not only ensuring kids have the nutrients they need to thrive but also that parents have a sustainable way to provide for their family in the long term and break the cycle of poverty. I share this story this week to help draw attention to World Food Day—a time when people around the world bring our best minds and hearts together to tackle, once and for all, the problems of child hunger and malnutrition.